To Cite: Ahanchian H , Davari M, Behmanesh F, Fadaee J. Skin Test Reactivity to Common Foods and Aereoallergens in Iranian Children with Acute Urticaria, Iran J Pediatr. Online ahead of Print ; 29(1):e79646. doi: 10.5812/ijp.79646. Background: Urticaria is one of the most commonly diagnosed pediatric skin disorders. Limited studies have been carried out to investigate acute urticaria-related allergens in Iranian children. Objectives: The purpose of this study was to evaluate the prick test findings in Iranian pediatric patients with acute urticaria. Methods: This cross-sectional study was performed on pediatric patients with acute urticaria September 2012 to 2017. Background data, such as age, gender, and history of other allergic diseases, were recorded. The subjects experienced the skin prick test to assess allergy to 45 aeroallergens, food, contact and insect allergens. Results: One-hundred twenty-nine children (male to female ratio: 1.22) with a mean age of 5.93 ± 4.29 years were studied. The most common food allergens were pepper (21.7%), egg white (20.9%), and walnut (17.8%). The most common aeroallergens were Salsola kali (37.5%), Dermatophagoides farinae (33.6%) and trees (32.6%). The mean age of patients with a positive reaction to sesame, pepper, Chenopodiaceae, Salsola kali, grass, Ash, and trees was higher than subjects with negative results, whereas sensitization to milk, beef, and lamb was common in younger children. Conclusions: According to the results of this study, the most common food allergens in Iranian pediatric patients with acute urticaria currently appear to be pepper, egg white, walnut and egg yolk. Urticaria is a type of pruritic erythematous papules or plaques associated with swelling of the dermis which is commonly presented in childhood (1). It is one of the most commonly diagnosed pediatric skin disorders, and 15% - 22.5% of children are affected during their lifetime (2-5). Urticaria can lead to significant negative effects on the quality of life (6) and cause school and workplace absenteeism as well as the impaired performance of people up to 30% of cases (7). Allergens are the main cause of urticaria, especially acute forms of it. The first step in the treatment of allergies is the recognition of the culprit allergen in order to avoid it (8). In the absence of evaluation and identification of these allergens, blind therapy can lead, in addition to the failure of treatment or relative improvement with recurrence, cause side effects of treatment (7). Furthermore, extensive and non-scientific food avoidance, sometimes applied to treat pediatric urticaria, can lead to malnutrition, developmental and behavioral disorders in the child (9, 10). As a result, the identification of these allergens and the proper management of urticaria in pediatrics are of great importance. In recent years, there have been many attempts to identify allergens associated with urticaria; however, most studies have been conducted on urticaria in adults (4, 5, 11). Very limited studies have evaluated the pediatric urticaria-related allergens up to now. Nevertheless, the differences in geographical location, the genetic status of the studied populations, the traditional dietary habits and socioeconomic and cultural status make it difficult to access a worldwide list of more commonly-diagnosed allergens associated with pediatric urticarial (7, 8, 11, 12). Findings from studies in any country are not consistent, and more studies are still required even in the same country (4, 5, 11). The studies conducted in Iran depend on the study time and area. The aeroallergens such as mites and trees (13, 14), herbaceous grass and grass (15, 16), and food allergens such as egg yolk (17), peanuts and walnuts (18), and milk (19) have been identified as the most common allergens related to urticaria. The latest study in the Iranian population to identify allergens associated with pediatric urticaria goes back to 2015. It is important to consider age, as well as any relationship between allergens and urticaria in identification etiology of urticaria. In addition, any changes in nutritional habits and environmental factors should be considered. Moreover, because of the high prevalence of allergic diseases especially pediatric urticaria, the research to be done in the diagnosis and treatment of this entity, seems to be important (8, 11). This study was conducted in Iran to identify urticaria-related factors with emphasis on foods, aeroallergens, contact and insect allergens in children with acute urticaria. The purpose of this study was to evaluate the skin-prick test findings in Iranian pediatric patients with acute urticaria. This analytical cross-sectional study was conducted on pediatric patients with acute urticaria referred to the Pediatric Allergy Clinic of Dr. Sheikh Hospital in Mashhad, Iran from September 2012 to 2017. In this study, patients were included consecutively in a census manner. Healthy children (with no infection) aged more than 3 months old and less than 18 years, who had been diagnosed with acute urticaria, were included in the study. Clinical criteria for the diagnosis of acute urticaria were urticaria lesions as a pruritic red skin disorder diagnosed by an allergist, lasting less than six-weeks. The patients were excluded from the study if there was no complete and accurate information in each of the data collection steps. The children, who were suspected of either viral or microbial co-infection or non-allergic underlying conditions during physical examination or in history, as well as those with a history of drug use within a month prior to the prick test were excluded from the study. In addition, a false positive prick test, a positive result obtained when a negative test was controlled, and positive tests were other exclusion criteria. A checklist was prepared for each patient in order to record the background data such as age, gender and history of other allergic diseases such as rhinitis, asthma, atopic dermatitis, anaphylaxis, allergic colitis, and other related information. Then, a SPT was performed to complete the checklist. Initially, it was assured that the patients did not use drugs that could interfere with SPT result. The skin scratches were done by lancet. The extract of allergens as well as positive (histamine) and negative (distilled water) controls were inoculated on the forearm at points with a distance of 2 cm for 15 minutes. The test result was reported to be positive if induration was greater than 3 mm. In the event of a positive result in negative control test, all responses were considered as negative. The dermographism was examined by creating skin scratches. The skin SPT was evaluated with 45 common allergens, including 12 aeroallergens ash, trees mixture (beech, sycamore, elm, black walnut, black willow, cotton wood, red oak, birch, shagbark hickory, hard maple), grass mixture (Kentucky blue, meadow fescue, orchard, ryegrass, timothy), Salsola kali, Chenopodiaceae, Dermatophagoidesfarina (DF), Dermatophagoidespteronyssinus (DP), Alternaria, Aspergillus, feather, cat and dog), 3 contact allergens (silk, wool and latex), 24 food allergens (cow’s milk, beef, lamb, egg white, egg yolk, chicken, peanut, almonds, walnuts, sesame, freshwater fish, tuna fish, wheat, cereals, rice, corn, pepper, curry powder, banana, grapes, soybean, orange, tomatoes and cocoa), and 6 insect allergens (cockroach, honey bee, yellow bee, wasp, bumblebee and fly). Regarding the fact that the prick test is one of the common methods of diagnosis of allergens in children with urticaria, and this test was done based on specific indications in this study, the studied patients received no intervention through the research project. However, the necessity and procedure of testing were explained to parents before the test, and the possible complications of the test and how to compensate for these adverse effects were announced by the researchers. An informed consent was obtained after a complete explanation for the patient’s parents. This study was conducted within the framework of a research project (code: 931445) in Mashhad University of Medical Sciences in Iran. First, the normal distribution of the quantitative variables was examined by the Kolmogorov-Smirnov test. The t-test or its nonparametric counterpart test, Mann-Whitney test was used to compare the age of patients with and without allergens. The contingency table chi-square test and Fisher’s exact test were used to compare the frequency of gender between the two groups with and without allergens. Odds ratio (OR) was calculated for allergens that had a significant relationship with gender using logistic regression. A P value less than 0.05 was considered as the significance level. All statistical analyzes were performed using SPSS version 18 (SPSS Inc. Released 2009. PASW Statistics for Windows, Chicago: SPSS Inc.). During the study, 174 children were referred to the clinic with complaints of urticaria. Out of these, 45 patients had exclusion criteria; the reasons for the exclusion were positive dermographism test (n = 7), positive for negative control (n = 8), negative for positive control (n = 18), and failure to complete the diagnostic tests (n = 12). Finally, this study was performed on 129 children (71 males, male to female ratio: 1.22) with the mean age of 5.93 ± 4.29 years (minimum 3 months, maximum 18 years). The majority of children (46.5%) were in the age range between 2 to 7 years. In 56 patients (43.3%), there was a history of at least one of the allergic diseases. SPT was positive for at least one of 45 allergens in 119 patients (92.2%). In the food allergens group, the highest sensitivity was found for pepper (21.7%), egg white (20.9%), and walnut (17.8%) (Figure 1). Considering all allergens, the most commonly reported positive allergens were Salsola kali (37.2%), DF (33.3%), and trees (32.6%), pepper (21.7%), egg white (20.9%), and walnut (17.8%). Among the aeroallergens, the highest sensitivity was to Salsola kali (37.2%), DF (33.3%), and trees (32.6). The test result was not positive for any contact allergens, and the only allergy was found to be cockroach (1.6%) in the group of insect allergens (Figure 1). Among the food allergens, egg white (28.0%), egg yolk (28.0%), beef (28.0%) and milk (28.0%) were the most prevalent allergens in the age group of less than 2 years. 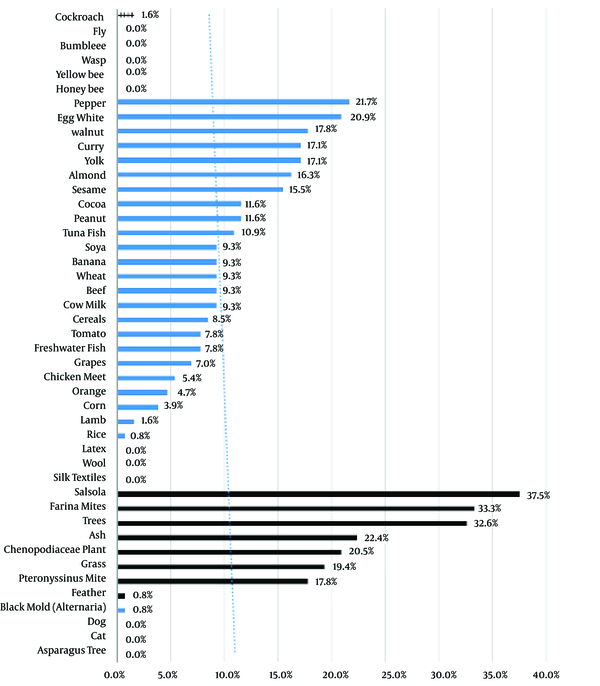 Egg white (20.0%) and peanuts (18.3%) in the age group of 2 to 7 years, and also pepper (27.6%) and almond (27.6%) in the age group of 7 to 12 years, and pepper (46.7%) and curry (26.7%) in the age group of over 12 years were the most common food allergens (Table 1). Among the aeroallergens, DF (36.0%) and DP (32.0%) were the most prevalent allergens in the age group of less than 2 years. Whereas trees (28.3%) and DF (25.0%) between 2 to 7 years, and trees (55.2%) and Salsola kali (37.9%) in the age group 7 to 12 years, and trees (46.7%) and DF (40.0%) in the age group of more than 12 years were more common (Table 2). Based on the results, only 10 cases of allergens were found to have a significant relationship between allergen and age. The mean age of affected subjects in the case of food allergens of milk, beef, and lamb was less than that of non-affected subjects and the age was higher in subjects of sesame and pepper sensitization (Table 1). The mean age of affected subjects was also higher than that of non-affected cases in Chenopodiaceae, Salsola kali, grass, ash, and trees (Table 2). The results of this study showed that sensitivity to allergens of DF, DP, and Banana was significantly higher in females, and allergy to Orange was more in the male gender. No significant relationship was found between gender and other allergens. Fifty-six (43.4%) patients had at least a history of one allergic disorder (allergic rhinitis, asthma, atopic dermatitis, anaphylaxis, allergic colitis). 84 (65.1%) were allergic to at least one aeroallergen. There was no statistically significant correlation between the patient’s history of allergy and positive SPT (P = 0.862). One hundred (77.5%) of them were allergic to at least one food allergen. There was no significant correlation between the previous history of allergy and positive prick test (P = 0.499). This study was conducted to identify the most prevalent triggers of acute urticaria in Iranian pediatric patients. Pepper, egg white, and walnut had the highest sensitization in children with acute urticaria; Salsola kali, DF and trees were the most common aeroallergens. Since genetic status, geographical location, socioeconomic and cultural status are among the factors that influence diversity of exposure to allergens, comparing the findings of this research with other studies in Iran seems important. Nevertheless, few studies have been conducted in Iran to identify allergens associated with pediatric urticaria. In a study by Hosseini et al. (19), the most common food allergens were milk, eggs, and wheat flour and among aeroallergens, Alternaria and Salsola kali. The study population included children with asthma, allergic rhinitis, atopic dermatitis and urticaria, but our study only consisted of children with urticaria. However, a common finding in our study and Hosseini et al.’s study were trees and Salsola kali as the most commonly diagnosed aeroallergens in pediatrics. The results of studies conducted on Iranian adults are sporadically consistent with the findings of our study. Perhaps the most common causes of different results are different age groups, underlying allergic conditions, and different cultural habits in various geographic areas. In a study by Farrokhi et al. (18), peanut, walnut, and tomato were the most common food allergens, as well as House dust mites, Salsola kali and Palm pollen the most common aeroallergens. The common finding in our study and that of Farrokhi et al.’s was walnut as one of the most common food allergens as well as Salsola kali and trees as the most common aeroallergens. Due to the similarity of profilin protein in fruits (grape, melon, etc.) and vegetables with plant proteins found in weed (Salsola kali) and Trees, sensitization to aeroallergens such as Salsola kali and Trees can indirectly explain the etiology of some allergic manifestations in children including oral allergy syndrome and urticaria. No positive sensitivity to dogs or cats in our study was found, but the results of studies in Western countries have shown a high prevalence of these allergens which can be due to the cultural difference and the greater contact of children in these areas with pets (20-22). Different prevalence of a food allergy can be due to different diet habits in various ethnic groups. For instance, although peanut allergy is one of the common food allergens in western countries, its prevalence was low in the current study and other Iranian studies (17-19). Nonetheless, there was a higher allergic sensitization to sesame and walnut compared to western countries which increased significantly with age (2, 23-25). The relationship between the age and prevalence of sensitization to different allergens was one of the interesting findings in our study. It showed that in children with urticaria, the prevalence of allergies to cow’s milk, beef and lamb is higher in children under 5 years and decreases with growing age. It can be explained with better immune development and tolerance induction. This is consistent with studies in other countries and western societies (26). On the other hand, it was found that the prevalence of aeroallergens including Chenopodiaceae, Salsola kali, grass, Ash, and trees are increased in older ages, which could be attributed to increased contact with these allergens with age. Moreover, the prevalence of allergies to pepper and sesame increases with age. In our study, like majority of Iranian studies, the prevalence of male gender was higher among the subjects with urticaria. The male to female ratio was 1.2, and this ratio has been reported differently between 1.1 and 1.65 in other Iranian studies (15, 16, 18, 19); however, non-Iranian studies often showed that the prevalence of pediatric urticaria was greater in females than males (3). Interestingly, a meaningful relationship was found between female gender and allergies to mites and banana as well as between male gender and allergies to orange in our study. It seems that these are often random findings of studies, and no claims can be made regarding the relationship between gender and acute urticaria based on the size of the sample and the type of study performed. To the best of our knowledge, this is the first Iranian study to investigate pediatric acute urticaria. The findings of this study are important because the causes of acute urticaria in children are different from adults and those of chronic urticarial (27-29). The Identification of the common causes of urticaria can help physicians improve management of children with acute urticaria. In addition, as Shin and Lee in 2017 (11) pointed out, population-based studies that address the causes of acute pediatric urticaria are very limited, and so our study was an attempt to provide further data in this area. Furthermore, our study is among the few studies that have investigated specifically the relationship between allergens and acute urticaria. The skin tests like SPT, are the primary tools to diagnose Ig E-mediated diseases (30). Acute urticaria is often mediated by Ig E (31). In this disease, the SPT shows sensitivity to allergens. In the case of food allergy, confirmation of the correlation between sensitivity to the allergen (found in SPT) and induction of the urticaria, needs to get a history from the patient. If the skin sensitivity was shown with SPT, the culprit food should be removed from the patient’s diet. By doing so, the clinical symptoms of the patient should be improved. Reoccurring signs of allergy, like acute urticaria with retaking the culprit food, proves the diagnosis (32). Our study examined only the sensitivity to common food allergens and overviewed sensitivity to common allergens in Iranian children. For each patient, if the SPT was relevant to history, the elimination regimen and oral food challenge had to be done. It was a limitation of our study, not performing food challenges. In addition to allergens, other causes of acute urticaria including infections (bacterial, viral and parasitic), medications especially nonsteroidal anti-inflammatory drugs, insect bite and transfusion side effects in their daily practice should be considered (11, 33, 34). In the current study, children with a history of infection or drug consumption were excluded. Despite the fact that in the present study that reviewed all data collected from patients, who met the inclusion criteria, in 5 years, it seems that there is a need for further studies with larger sample size. According to the results of this study, the most common food allergens in Iranian pediatric patients with acute urticaria appear to be pepper, egg white, walnuts and egg yolk. The prevalence of food allergy due to, cow milk, beef, lamb, egg white and yolk decrease as child ages whereas nuts and pepper become the common allergens. This article was adapted from a research project (grant No. 931445), funded by the Deputy of Research at Mashhad University of Medical Sciences. The authors thank Dr. Ali Jafari, Dr. Mohammad Ali Kiani, Dr. Hamidreza Kianifar and Dr. Nasrin Moazzen for referring patients and helping to interpret the SPT. Authors' Contribution: Study concept and design: Hamid Ahanchian, and Fatemeh Behmanesh; analysis and interpretation of data: Mina Davari; drafting of the manuscript: Javad Fadaee; statistical analysis: Javad Fadaee. Ethical Considerations: Regarding the fact that the prick test is one of the common methods of diagnosis of allergens in children with urticaria, and this test was done based on specific indications in this study, the studied patients received no intervention through the research project. However, the necessity and procedure of testing were explained to parents before the test, and the possible complications of the test and how to compensate for these adverse effects were announced by the researchers. An informed consent was obtained after a complete explanation for the patient's parents. Funding/Support: This article was adapted from a research project (grant No. 931445), funded by the Deputy of Research at Mashhad University of Medical Sciences. 1. Nowak-Wegrzyn A, Sampson HA. Reaction to food. In: Adkinson NF Jr, Burks AW, editors. Middleton's allergy E-book: Principles and practice. 5th ed. Elsevier Health Sciences; 2013. p. 1312-3. 2. Konstantinou GN, Papadopoulos NG, Tavladaki T, Tsekoura T, Tsilimigaki A, Grattan CE. Childhood acute urticaria in northern and southern Europe shows a similar epidemiological pattern and significant meteorological influences. Pediatr Allergy Immunol. 2011;22(1 Pt 1):36-42. doi: 10.1111/j.1399-3038.2010.01093.x. [PubMed: 21261743]. 3. Bruske I, Standl M, Weidinger S, Klumper C, Hoffmann B, Schaaf B, et al. Epidemiology of urticaria in infants and young children in Germany--results from the German LISAplus and GINIplus Birth Cohort Studies. Pediatr Allergy Immunol. 2014;25(1):36-42. doi: 10.1111/pai.12146. [PubMed: 24236825]. 4. Meena H, Dara P, Sharma BS, Choudhary R, Sharma P. Chronic urticaria in children: An update about etiology. MOJ Immunol. 2017;5(4):162. doi: 10.15406/mji.2017.5.00162. 5. Lee SJ, Ha EK, Jee HM, Lee KS, Lee SW, Kim MA, et al. Prevalence and Risk Factors of Urticaria With a Focus on Chronic Urticaria in Children. Allergy Asthma Immunol Res. 2017;9(3):212-9. doi: 10.4168/aair.2017.9.3.212. [PubMed: 28293927]. [PubMed Central: PMC5352572]. 6. Staubach P, Dechene M, Metz M, Magerl M, Siebenhaar F, Weller K, et al. High prevalence of mental disorders and emotional distress in patients with chronic spontaneous urticaria. Acta Derm Venereol. 2011;91(5):557-61. doi: 10.2340/00015555-1109. [PubMed: 21597672]. 7. Staubach P, Gilfert T. Pediatric Urticaria. Curr Dermatol Rep. 2015;4(2):83-9. doi: 10.1007/s13671-015-0104-7. 8. Smallwood J. Urticaria: "You're probably just allergic to something". Pediatr Ann. 2016;45(11):e399-402. doi: 10.3928/19382359-20161014-02. [PubMed: 27841923]. 9. Loth KA, MacLehose RF, Fulkerson JA, Crow S, Neumark-Sztainer D. Are food restriction and pressure-to-eat parenting practices associated with adolescent disordered eating behaviors? Int J Eat Disord. 2014;47(3):310-4. doi: 10.1002/eat.22189. [PubMed: 24105668]. [PubMed Central: PMC3963280]. 10. Sicherer SH, Sampson HA. Food allergy. J Allergy Clin Immunol. 2010;125(2):S116-25. doi: 10.1016/j.jaci.2009.08.028. 11. Shin M, Lee S. Prevalence and Causes of Childhood Urticaria. Allergy Asthma Immunol Res. 2017;9(3):189-90. doi: 10.4168/aair.2017.9.3.189. [PubMed: 28293924]. [PubMed Central: PMC5352569]. 12. Tsakok T, Du Toit G, Flohr C. Pediatric urticaria. Immunol Allergy Clin North Am. 2014;34(1):117-39. doi: 10.1016/j.iac.2013.09.008. [PubMed: 24262693]. 13. Ghafari J, Rafat Panah H, Khalilian A, Nazari Z, Ghafari R. [Prevalence of aeroallergens in patient with asthma, allergic rhinitis and chronic urticarial]. Med J Mashhad. 2011;54(1):44-9. Persian. 14. Kashef S, Kashef MA, Eghtedari F. Prevalence of aeroallergens in allergic rhinitis in shiraz. Iran J Allergy Asthma Immunol. 2003;2(4):185-8. [PubMed: 17301378]. 15. Farhoudi A, Razavi A, Chavoshzadeh Z, Heidarzadeh M, Bemanian MH, Nabavi M. Descriptive study of 226 patients with allergic rhinitis and asthma in Karaj city. Iran J Allergy Asthma Immunol. 2005;4(2):99-101. [PubMed: 17301430]. 16. Movahedi M, Moin M, Farhoudi A. A comparison between diagnostic clinical tests and herbal geography in allergic patients in Tehran and Karaj cities. Iran J Allergy Asthma Immunol. 2000;1(1):29-31. 17. Fouladseresht H, Safiri S, Moqaddasi M, Razeghi MS, Bazargan N. [Prevalence of food and airborne allergens in allergic patients in Kerman]. J Kermanshah Univ Med Sci. 2014;18(4):234-41. Persian. 18. Farrokhi S, Gheybi MK, Movahed A, Iranpour D, Ostovar A, Vahdat K, et al. [Evaluation of the frequency of food and aeroallergens in patients with eczema and urticaria in province of Bushehr: Based on skin prick test reactivity]. ISMJ. 2014;17(4):629-37. Persian. 19. Hosseini S, Shoormasti RS, Akramian R, Movahedi M, Gharagozlou M, Foroughi N, et al. Skin prick test reactivity to common aero and food allergens among children with allergy. Iran J Med Sci. 2014;39(1):29-35. [PubMed: 24453391]. [PubMed Central: PMC3895892]. 20. Pite H, Wedi B, Borrego LM, Kapp A, Raap U. Management of childhood urticaria: Current knowledge and practical recommendations. Acta Derm Venereol. 2013;93(5):500-8. doi: 10.2340/00015555-1573. [PubMed: 23546182]. 21. Marrouche N, Grattan C. Childhood urticaria. Curr Opin Allergy Clin Immunol. 2012;12(5):485-90. doi: 10.1097/ACI.0b013e3283574cb3. [PubMed: 22825024]. 22. Bailey E, Shaker M. An update on childhood urticaria and angioedema. Curr Opin Pediatr. 2008;20(4):425-30. doi: 10.1097/MOP.0b013e328305e262. [PubMed: 18622198]. 23. Graif Y, German L, Livne I, Shohat T. Association of food allergy with asthma severity and atopic diseases in Jewish and Arab adolescents. Acta Paediatr. 2012;101(10):1083-8. doi: 10.1111/j.1651-2227.2012.02776.x. [PubMed: 22759215]. 24. Irani C, Maalouly G, Germanos M, Kazma H. Food allergy in Lebanon: Is sesame seed the "middle eastern" peanut. World Allergy Organ J. 2011;4(1):1-3. doi: 10.1097/WOX.0b013e318204b745. [PubMed: 23283020]. [PubMed Central: PMC3651063]. 25. Prescott SL, Pawankar R, Allen KJ, Campbell DE, Sinn J, Fiocchi A, et al. A global survey of changing patterns of food allergy burden in children. World Allergy Organ J. 2013;6(1):21. doi: 10.1186/1939-4551-6-21. [PubMed: 24304599]. [PubMed Central: PMC3879010]. 26. Sicherer SH. Epidemiology of food allergy. J Allergy Clin Immunol. 2011;127(3):594-602. doi: 10.1016/j.jaci.2010.11.044. [PubMed: 21236480]. 27. Sackesen C, Sekerel BE, Orhan F, Kocabas CN, Tuncer A, Adalioglu G. The etiology of different forms of urticaria in childhood. Pediatr Dermatol. 2004;21(2):102-8. doi: 10.1111/j.0736-8046.2004.21202.x. [PubMed: 15078346]. 28. Lin YR, Liu TH, Wu TK, Chang YJ, Chou CC, Wu HP. Predictive factors of the duration of a first-attack acute urticaria in children. Am J Emerg Med. 2011;29(8):883-9. doi: 10.1016/j.ajem.2010.04.004. [PubMed: 20627220]. 29. Brunetti L, Francavilla R, Miniello VL, Platzer MH, Rizzi D, Lospalluti ML, et al. High prevalence of autoimmune urticaria in children with chronic urticaria. J Allergy Clin Immunol. 2004;114(4):922-7. doi: 10.1016/j.jaci.2004.07.042. [PubMed: 15480336]. 30. Chiriac AM, Demoly P. In vivo methods for the study and diagnosis of allergy. In: Adkinson NF Jr, Burks AW, editors. Middleton's allergy E-book: Principles and practice. 5th ed. Elsevier Health Sciences; 2013. 1119 p.
31. Stalling AP, Franck MM, Sicherer SH. Urticaria and angioedema. In: Klingman RM, Stanton BF, St . Geme JW, Schor NF, Behrman RE, editors. Nelson textbook of pediatrics. 20th ed. Elsevier Health Sciences; 2016. p. 1126-7. 32. Nowak-Wegrzyn A, Sampson HA. Reactio to Food. In: Adkinson NF Jr, Burks AW, editors. Middleton's allergy E-book: Principles and practice. 5th ed. Elsevier Health Sciences; 2013. 1326 p.
33. Sahiner UM, Civelek E, Tuncer A, Yavuz ST, Karabulut E, Sackesen C, et al. Chronic urticaria: Etiology and natural course in children. Int Arch Allergy Immunol. 2011;156(2):224-30. doi: 10.1159/000322349. [PubMed: 21597304]. 34. Woo YR, Jung KE, Koo DW, Lee JS. Vitamin D as a marker for disease severity in chronic urticaria and its possible role in pathogenesis. Ann Dermatol. 2015;27(4):423-30. doi: 10.5021/ad.2015.27.4.423. [PubMed: 26273159]. [PubMed Central: PMC4530153].